Vang Pao led a secret war against Vietnam-backed communists in Laos. Vang Pao speaks at the Vietnam Memorial in Washington, DC, May 11, 2000. Vang Pao, a leader of the Hmong ethnic group of Laos who spearheaded a 15-year CIA-sponsored secret war in the Southeast Asian state during the Vietnam War, has died at the age of 81. The outspoken opponent of the Lao government who immigrated to the United States after the communists seized power in his country in 1975, died of pneumonia with heart complications Thursday, according to a hospital spokeswoman. Vang Pao had been in hospital since Dec. 26, 2010 and was with his family at the time of his death, according to Michelle Von Tersch of the Clovis Community Medical Center in California. Tsong Pao Lee, director of the Hmong Cultural Center in St. Paul, Minnesota, said Vang Pao would be greatly missed. Dr. Khamlay Mounivong, a Lao-Canadian democracy activist, said Vang Pao was a tireless activist on behalf of the Hmong people. Houmphanh Saignasith, a former cabinet member of the now defunct Royal Lao Government who has since relocated to France, said Vang Pao was an intrepid military strategist and staunch nationalist. Tens of thousands of ethnic Hmong are expected to attend his funeral, a date for which has not been set. Negotiations are underway to decide where he will be buried. While some said he would be laid to rest in the California city of Fresno, the home to a thriving Hmong community, his close friend Charlie Waters told AFP that Vang Pao’s family was pressing for his remains to be interred in Arlington National Cemetery in Virginia, in honor of the help he provided the U.S. during the Vietnam War. "He worked for the U.S. government at their request, and it's his request ... he wants to be with the rest of the warriors," Waters said. Mayor Ashley Swearengin of Fresno, said in a statement that Vang Pao had been “a hero to the Hmong community” throughout the country. “For far too long … Vang Pao carried the burden of a proud people longing to be free and independent. And today, in the United States of America, and as a proud American, Vang Pao has more than earned a well-deserved rest,” the former senator said in a statement. Nearly 250,000 Hmong live in the U.S., with the largest concentrations based in California, Minnesota, and Wisconsin. The Lao communist government issued a subdued statement about the general’s passing. "He was an ordinary person, so we do not have any reaction," a government spokesman was quoted by AFP as saying. 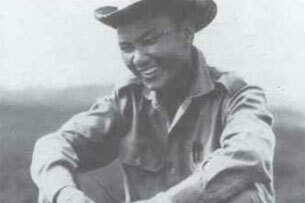 After fighting as a teenager against the Japanese in World War II and the North Vietnamese in the 1950s, Vang Pao became the first Hmong to achieve the rank of general in the Royal Lao Army. He was later enlisted by the U.S. to lead an army of Hmong, Laotian, and Thai mercenaries in a secret war against the communist Pathet Lao and Vietcong during the Vietnam War. During his 15 years of fighting for the U.S., the CIA airline Air America ferried Vang Pao and his troops throughout Laos where they disrupted Vietnamese supply lines and fought to prevent a Vietnamese-backed communist victory in the country. When the communists took over Laos, abolishing the monarchy and establishing the Lao People’s Democratic Republic in November 1975, Vang Pao immigrated to the U.S. and has since been credited for helping to negotiate the resettlement in America of tens of thousands of Hmong. Vang Pao was considered by many Hmong to be a leader in exile who fought on their behalf for greater rights within the U.S. and in Laos, where many say they still face persecution by the government. But the former general was also dogged by controversy throughout his later life for his methods of waging war. While he was later honored as a hero by former CIA chief William Colby, Vang Pao himself once said he was responsible for the deaths of 17,000 men, or nearly 10 percent of the Hmong population, as a result of allying himself with the U.S. In 2002, allegations arose that Vang Pao had financed his campaign during the Vietnam War and filled his own coffers by trafficking opium—charges which he fervently denied. In 2007, Vang Pao was arrested in California on charges of conspiring to overthrow the Lao government by supporting a group known as Neo Hom in raising an army of mercenaries and outfitting them with AK-47 rifles and missiles. Those charges were dropped in 2009. Reported by Max Avary for RFA’s Lao service. Translated by Viengsay Luangkhot. Written in English by Joshua Lipes. thanks for the supports, he is very well missed, a great Leader well known thru out the world of many strenght and sorrows, buttom line, peace to the world of all mankind. That's a sad event for the loss of great hero of Laos, Mr Vang Pao. Please rest in peace, Lao country will be liberated soon by Lao people itself to remove all slave of Vietnam communist. Oh! This is a great loss to the world hero, we would keep you in our mind forever Vang Pao. In your fighting against Vietnamese invasion, you had killed more than 8lakhs of Vietcong. You're a real man to prevent the spread of Communists around the IndoChina such as Khmer Krom Land, Laos and Cambodia.